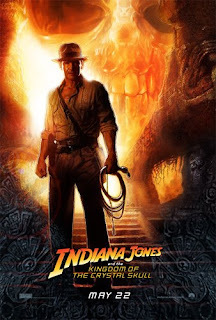 The Billionty-Oneth Geek: Invading THE KINGDOM OF THE CRYSTAL SKULLS with DOCTOR JONES! Invading THE KINGDOM OF THE CRYSTAL SKULLS with DOCTOR JONES! The Hollywood of late has seemed to think it's their duty to tap into our nostalgia; by producing sequels to movies we saw in the 80s, producing remakes, or bringing cartoons to film (eg. this film, Transformers, Rambo, the upcoming G.I. Joe, remake of F13th [much to my chagrin], etc.). For the most part, it seems to be paying off, at least financially and at the same time, it's all great for the world of geek, but is it right? I mean, there's a certain part of that nostalgic feeling that is taken away when you view it's more newer incarnation and then go back and view it's older predecessors. To me, it just seems like we're cheapening our memories and feelings for the original material all for just a mediocre-to-cheap thrill. That brings us to this film, Indiana Jones and the Kingdom of the Crystal Skulls. I don't want to get into too much of the plot as it can get spoilerific. I'll use the synopsis from IMDB: "Famed archaeologist/adventurer Dr. Henry "Indiana" Jones is called back into action when he becomes entangled in a Soviet plot to uncover the secret behind mysterious artifacts known as the Crystal Skulls." The movie starts off with an exciting opening, and does well for the next 20 minutes. But then it hits a lull, the action slows down and there's more sleuthing by Dr. Jones... this seems to run on for an hour. However, once Indy and crew hit the Amazon, it's quite relentless. Harrison Ford brings his A-game to Crystal Skull, and it's obvious that he's having fun. Indy, this time around seems to have more of a humourous edge than he did with films earlier in the series. I'm not saying he didn't crack funny lines in the past movies, but just more so. However, when it's business time, he gets down to business. I'm not the biggest Shia fan, but he was fine (or at least tolerable) in the role of Mutt Williams. There's a few scenes where it's just so clear that they're trying to shape him up for a possible spin-off movie/series. In the final shot of the movie, Mutt does something that ALMOST seems to prove that too. And as I'm watching this, I'm slapping my face (not in the good way) because I think it's going to happen, but then... well, you'll have to see it for yourself. In the end, I thought it was an entertaining film, but certainly not the best of the 4 (I'd order it Raiders, Temple, Crusade, and Crystal Skull... oddly enough, in the order of their release). I question the standing ovation given at its premiere screening at Cannes this year, but from what I hear, that festival is pretty fucked up anyways underneath all the glitz and glamour. In talking with my pastor last weekend (before I had seen it myself) he mentioned an element to this movie that seems to have separated it from the realm of possibilities of the others, and I'd have to say that I agree. It's definitely one of the reasons I've slotted it in fourth. It's the main subject of the movie, so I can't give it away, but you'll find out 15 minutes into the movie. Last point of note. John Hurt is a great man. In the past few years, he's been in so many geektastic movies: Hellboy, V for Vendetta, one of the Harry Potters, now Indiana Jones, and hopefully Hellboy 2 later this summer. A quick browse at IMDB shows that he's got a ton of more stuff coming out in the next year alone, which is great given his age. And hopefully for us, it's more geekgasmic work.